I have a confession: I often do my makeup without a mirror! I know, I know… how is that possible? Well, I’ve perfected it and it wasn’t until I found the Jerdon Makeup Mirror that I realized what a pathetic excuse for a mirror my bathroom cabinet mirror was! The Jerdon JGL9W Lighted Makeup Mirror is a bathroom and makeup mirror with cool to the touch fluorescent lighting and adjustable side mirrors that fit nicely on any tabletop. It has an adjustable center that swivels from 1X to 5X magnification to make sure every detail of your hair and makeup are in place and your cat eyes are on point. The JGL9W also has a tri-fold design with 2 side mirrors so you can have a panoramic view and look at all angles. The fluorescent lighting is glare free and comes with 4 different illumination setting: daytime, evening, home and office. 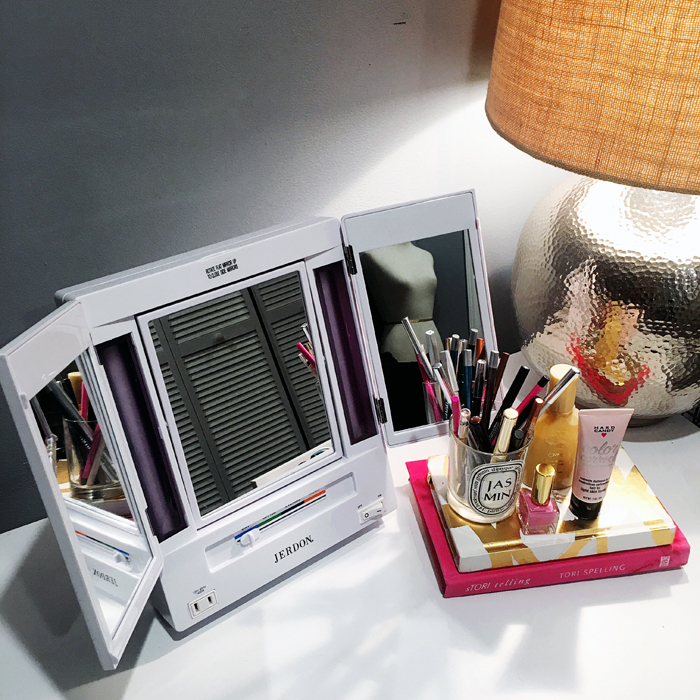 Sounds pretty standard for a makeup mirror, right? Guess again! This baby has a built-in electrical outlet to plug in your curling iron, blowdryer, flat iron or even your cell. No more excuses for not using a mirror to put on makeup or do my hair ever again!